We have the nicest customers at The Minky Boutique!! They take the time to e-mail us and let us know how much they are enjoying our products. Feel free to browse through their comments below! Please contact us with your comments and suggestions. 100% customer satisfaction is our goal and we value your input! Just received my blanket and it is beautiful!! Looks to be made with perfection. I received my blanket yesterday and it was flawless! You did an excellent job, and I could not be more satisfied with my purchase. I plan on ordering from you again! Thank you. Your kindness is amazing. Thank you, I will definitely tell everyone about The Minky Boutique! Thank you, again. The blanket was here when we got home on Monday afternoon. It is so beautiful - perfect in every way. You do the most amazing work. I can't wait to give them to my grandsons for Christmas presents. Again, thank you for the most precious, beautiful blankets. They are so special in every way!! I received the blanket, it's beautiful. Thank you. I look forward to making another purchase with your company again. Abby is one happy girl. They are beautiful! Thanks again. for the rush order, and for the beautiful work. Hi there just wanted to write to you and tell u how happy I am with my 2 blankets thank you so much! I want to thank you for the wonderful job you have done on my granddaughters blankets. I will tell you that you should be very happy with yourself for taking pride in the quality of your items you offer , they are absolutely wonderful and it isn't every day you find some one that puts PRIDE into their work. Keep up the wonderful work and the rewards will always be there to bless you. God Bless & I will share you & my experience with others. I received my minky fabric last week - it looks great! I can't wait to use it! The cowboy swatch you also included is very cute! Thank you for sending me a great product! The blanket got here yesterday and it's absolutely dead-on what I wanted! It's absolutely beautiful and I love it - thank you for the extra leg-work you did to get the satin for the back of it. I got the blanket today and it is beautiful. I can't wait to give it to my friend as a gift. I also know that Heather Barkin ordered a blanket for me. I haven't seen it yet but can't wait to finally get one as a gift. I love your stuff...thank you again for doing such a great job! We had a wonderful holiday season and hope you did also. The girls absolutely loved their Minky Quilts. They were so excted and in total awe!! Compliments came from friends and family members all around. Everyone wants one. Denise, the workmanship you did on these quilts was exquisite and I really want to thank you fo all the time and effort you put into making them. I will have to say that these quilts were the highlight of our holidays. I want to order a couple more blankets for my grandkids in a couple months so I will be in touch with you. Again, thank you for making this a most memorable holiday season for all of us!! Thank you for being so great! I ALWAYS get my fabric on time, it is always perfectly cut and the right color! This is where I get ALL my minkey fabric-so reliable I wouldnt want to shop anywhere else!! The other part of the lovely experience with The Minky Boutique blanket and pillow is not just the quality and striking beauty of the end product...but, working with such a nice person named DENISE! Everything from start to finish (and all the frequent e-mails from me!) was met with patience and kindness. I'm most certain your kids turned out just like you! (How fortunate they are.) Thanks so much! Just wanted to let you know that the Minky blanket and pillow arrived safely. It is absolutely gorgeous!!! Thanks and thanks and thanks again for your patience in the process - and your attention to detail every step of the way. It will be cherished for years to come! Thank you so very much for this beautiful fabric. Can't wait to get started on making a bear for my little customer with it. First time I've seen minkee fabric. Love it. Plan to buy more! Thank you so very much for the FAST delivery so I'll have no problem meeting my deadline. Very appreciative!!! Wonderful!! Great fabric!! Excellent seller!! Fast shipping!! Thank you :-)! Thank you for sending my fabric so quickly! I needed it quickly and you met that need! The fabric is beautiful and cut very nicely. Thank you! The minky fabric is wonderful! It is the softest minky that I've ever felt! Seller is wonderful and I love that I can get 1/2 yard cuts! I'm sure I'll be back for more! ARE YOU KIDDING ME?!? This minky is TO DIE FOR! 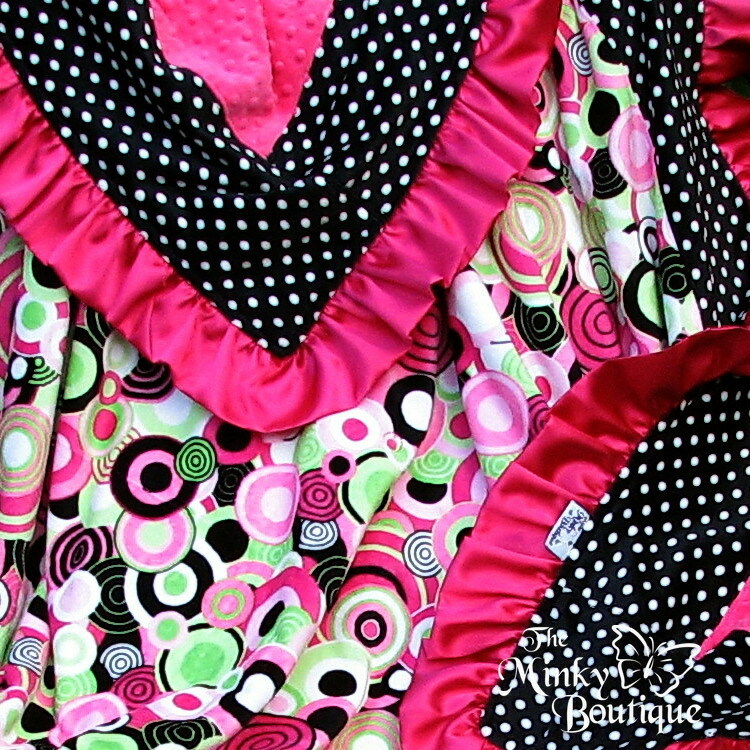 I have bought my "minky dot" fabric from XXXXX, and when they didn't have the color I needed, I went to the Minky Boutique. I wasn't very happy about spending 4 dollars more per yard than XXXXX, TIL I RECEIVED IT! This Minky is worth DOUBLE what I paid! I have NEVER felt minky this soft. And the colors are FABULOUS. THANK YOU Minky Boutique, I will be back for more!!! Oh and the shipping? SUPER FAST!!! A+++++++++++++++ Seller!!! Thank you so much for everything. The blankets are beautiful!! Received the minkys today - so cute and so well made! My sister and I love them. Just a quick email to say my order arrived today. Thank you so much, the minky is absolutely beautiful, one of my customers was with me when it arrived - she was just as excited as me. We spent 10 minutes just stroking it LOL! Thank you once again, I will be in touch soon with another order. The blanket was the perfect gift for my neice! Thanks so much for sending it quickly and for following up - love that and will definitely recommend you to friend! Becca absolutely loves it (minky ruffled blanket)! She was so speechless. Thank you, thank you! I was going to email you to say thank you! I received the blanket the other day, I love it! It's even better than I imagined! Thank you so much! I'm sure my little girl will love it as much as I do! I just wanted to take a moment to thank you for packaging my order in such a clean, careful manner. Your attention to detail has not gone unnoticed; I really appreciate it! It has been a pleasure doing business with you! WOW! That is so great. 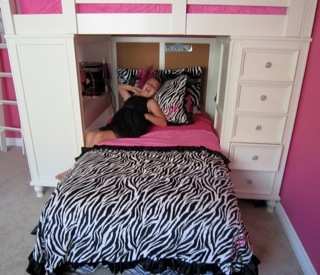 That blanket is over the top - I told you that you are the rockstar of the Minky world and this design just proves it! We all love our blankets. They are perfect. Thank You! I just got home and I am in awe of your work. This is truly beautiful. I am so happy, so glad I picked it out. Thank you, thank you! Oh my gosh, it is ABSOLUTELY gorgeous! I am so impressed with your work! Yes, the best work I have seen from you. It seems just like yesterday you told me that you were going to have to practice making ruffles. You have it down girl! I received my blanket today, I am so happy with it, it's a keepsake forever, the packaging was beautiful, the fabric, the design, the feel of the blanket is perfect, I'll treasure it, also a pleasure to deal with. 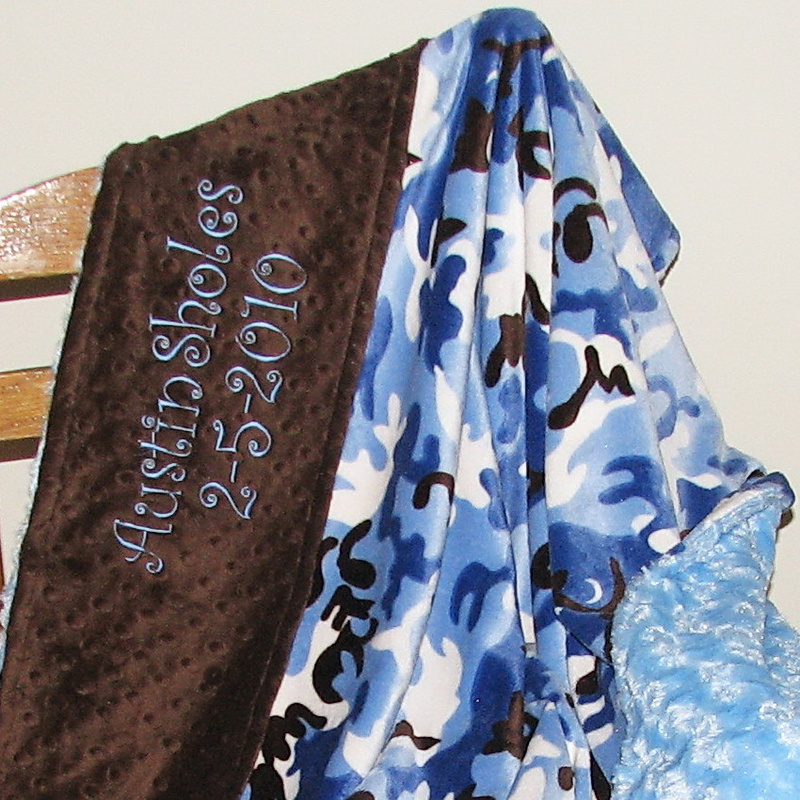 Can't wait for some babies to be born, your blankets are the perfect present. My apologies for not sending this sooner...I'm a busy working mommy! I wanted to thank you so much for the beautiful blanket, Paige loves it!! I will definitely be back for my future "minky blanket needs". Thank you so much for the photos! The blanket is absolutely perfect! Thank you, thank you, thank you!! I have a 4 month old daughter and I am going to be ordering her a blanket from you very soon! I just returned home. Called out of town just after we spoke/placing the order. The blanket is absolutely perfect! I appreciate your helping me with the colors/ruffle as well. The ruffle is just incredible & makes it so feminine. Thank you sooo very much. I'll be ordering again. I received the blankets!! I love them!!! Thanks so much! I just received my blanket in the mail and I love it! I got the fabric today and just had to drop you a line to tell you how grateful I am for the scraps. I'm sure that I can use each and every little piece........What a great selection of fabric that you carry!! 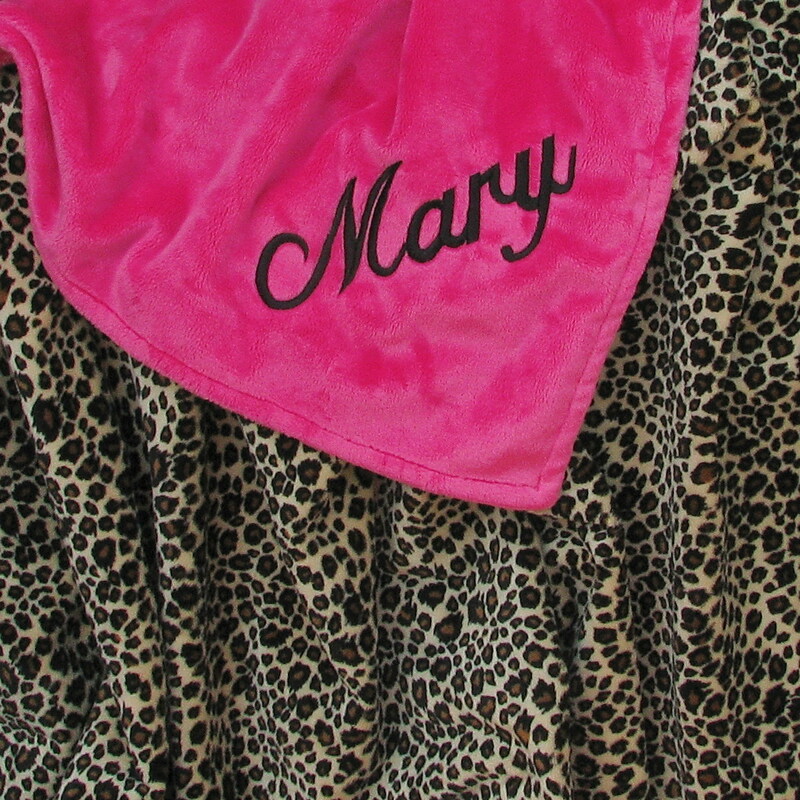 I love doing my applique with the Minky because it launders great and it don't ravel off like cotton will with time!!!! Thank you again!! I will be sure to send some pictures!! A stunning quality piece of fabric, totally thrilled with purchase. Love all the Minky I bought, so soft and luxurious... will be purchasing all my Minky from you from now on. I got the fabric, and it was perfect!! Thank you again! I will be ordering the hot pink now...I can't decide if I want 5 or 10 yards now!! Have a great day and again thanks so much!!! The blanket turned out great and my customer loved it. It arrived on Saturday just in time to get it to her before she delivered on Monday. Thank you so much for working quickly and also for accomodating the Boningo file. I am so glad to have found you. I received the blanket. It was a baby gift for friends. He is the football coach and the maroon and gold are the school colors and they loved it. I gave your website to several people who are interested. He absolutely LOVED his new blankie!...He sleeps with it, and takes it with him almost everywhere. It is so cute!! It arrived in great condition...I will send pictures soon. Thank you so much for such a great job on the blanket, it was wonderful. Mattea and I both LOVE her new blanket! Sorry I was not able to respond sooner but was visiting family on a sailboat in Hawaii. The package from The Minky Boutique was awaiting us at home, what a great surprise! I almost felt bad unwrapping it because of the beautiful tissue and bow, what a wonderful presentation! The thoughtful handwritten note was such a nice surprise. It is so refreshing to work with a company that has superior quality and customer service. We love the blanket and I am telling all my friends and family about The Minky Boutique. I can hardly wait for news of a new baby so I can order another one of your beautiful blankets, a must have for for every new Mom!!!! Thank you again and best wishes. Oh, I was so excited to get the box from MinkyBoutique today. The blankets are beautiful. I love them. Your work is fabulous. Thanks so much! Now, I can't wait to get the next order! Thank you so much for the blanket, it is sooo cute!!! The tulle around it is a great idea. I am giving it as a gift for a baby, I'm sure she will love it!!! We received the (blanket) order and love it! We will definitely refer your company to our friends! :-) Thank you! Perfect fabric, great price and FAST shipping!! Thank you much!!! It (the blanket) is beautiful! I am giving it to my boss's daughter and I am certain she will not have anything as nice. My granddaughter received one from the states and everybody loves it. Thank you, I will keep you in mind in the future. I bought my Mom a Minky Boutique Adult blanket for Christmas in Navy and burgundy. My Mom loved her blanket and claimed that it was so soft and warm and that the workmanship on the blanket is exquisite. I bought my sister and her husband a Minky blanket for Christmas and they absolutely loved it. The workmanship of this blanket was truly well done. My sister and her husband love the blanket so much that they fight over who gets to use it when they are watching TV. I want to tell you that I received the blue/pink sample with the monogramming today, and I love it. It is perfect...Gorgeous work! I just received the Minky blanket on the weekend. It did turn out beautifully. Candice was very happy; she especially loved her monogram and the font that it was in. Thanks. 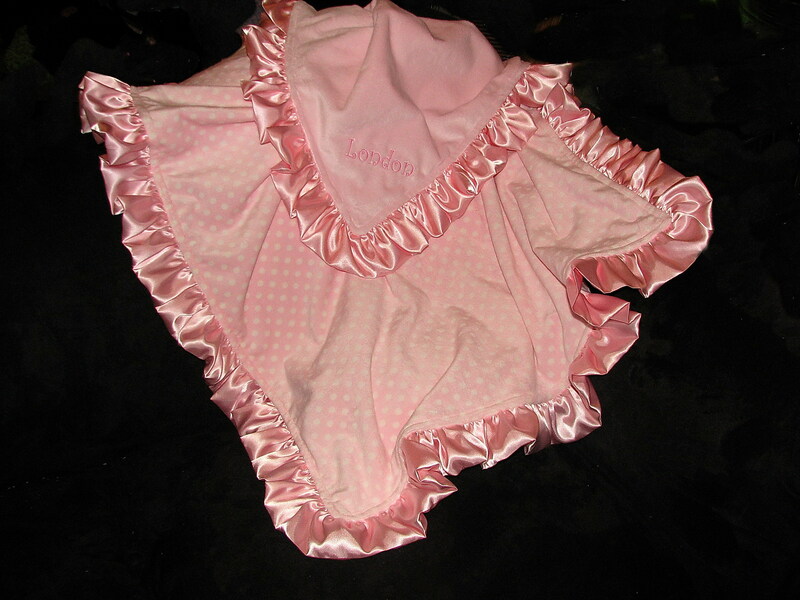 Super cute fabric, as described & quick shipping. Great fabric, great price! Thank you!! Fast shipping! rocking horse. Thank you for doing such a wonderful job creating this much loved gift. Will send more pics (BETTER) after the "to do's" of Christmas. The Griffs LOVE the blankets! I hope you had a blessed Christmas. And the Griff puppies love them too!!!!!!!!! My bolt of fabric was shipped the next day, in great shape, and it looks amazing! LOVE my minky!! Thank you! a lifelong and trusted friend. Yes, the blanket has arrived and I love it. Thank you so much! Awesome fabric - thank you!! Better then expected! !